Achilles tendinopathy is one of the most common lower-limb overuse sports injuries and is also frequent in the general population . Annual incidence rates of Achilles tendon complaints have been reported as 7% and 9% respectively in elite runners and 14% generally in athletes [2-4]. A large cohort of 57,725 Dutch patients registered with a GP established an annual incidence rate of mid-portion Achilles Tendinopathy as 1.85 per 1000 patients registered. Remarkably only 35% of the cases in the study were related to sports activity . Despite the significant incidence, the exact aetiology remains unknown and is considered multi-factorial. Variations in lower-limb biomechanics have been reported to be aetiological factors in up to two-thirds of athletes with Achilles tendon complaints [4,6]. Anatomical malalignment and poor neuromuscular control are thought to result in uneven loading and stress within the Achilles tendon subsequently resulting in microtrauma . Lower-limb biomechanical studies in the literature include the investigation of lower-limb kinetics and temporospatial characteristics. Kinetics is the analysis of the ground reaction forces and plantar pressures produced during movement. Ground reaction forces are measured using fixed force plates, or now more commonly instrumented treadmills [8,9]. Temporospatial characteristics are the fundamental parameters of an individual's gait recorded during the gait cycle. These parameters include the measurement of time and distance of steps and strides and phases of the gait cycle, from initial contact to toe-off and also the calculation of speed including gait speed and cadence (step frequency). Parameters are acquired accurately using kinematic or kinetic techniques . The VISA-A is a widely used, simple yet robust assessment of the severity of Achilles Tendinopathy. VISA-A has been repeatedly shown to have good content validity and inter-tester reliability not only in English but also in the multiple languages it has been translated into [11,12]. The fundamental symptom in Achilles tendinopathy is pain in the Achilles tendon often worse with activity, consequentially resulting in a reduction in activity levels and function. From the results of our systematic review on lower-limb gait biomechanics in Achilles tendinopathy we established several significant biomechanical characteristics in individuals with Achilles tendinopathy . Despite the established relationship between biomechanics and Achilles tendinopathy, to date no single study has investigated the relationship between these biomechanical variations and clinical severity of Achilles tendinopathy. To establish whether an association exists between Achilles tendinopathy clinical severity (measured by VISA-A score) and lower-limb biomechanical kinetic and temporospatial variables. Utilising the Medical Research Council ethics decision tool this study was identified under the category of 'Service Evaluation', as the participants were not randomised to different groups and the study protocol did not require changing treatment or patient care from accepted standards for any of the participants involved . Despite no formal ethical approval being required, the study fully complied with ethical standards. All participants were fully informed of the objectives of the clinic and research when they attended following referral from a healthcare practitioner. All data collected during the study was anonymised and complied with Data Protection Act 1998 principles. All participants were informed that they were able to withdraw from any or all components of the study at any time. Patients with a clinical diagnosis of Achilles tendinopathy were referred from local healthcare professionals to the National Tendinopathy Centre at the Institute for Sport, Exercise and Health (ISEH). These patients were then assessed by a Sport and Exercise Medicine (SEM) consultant and the diagnosis confirmed and classified using ultrasound imaging (Figure 1). Adults with Achilles tendinopathy (confirmed on ultrasound), able to undertake all testing procedures. Participants with concurrent lower-limb musculoskeletal pathology and those not consenting to the anonymous use of their data in the research project. Vertical ground reaction forces, centre of pressure measurements, loading rates and temporospatial data were measured using a Kistler Gaitway Instrumented Treadmill™ (Force plate inbuilt). Parameters were exported directly from the treadmill software (Gaitway Version 2.08) into Microsoft Excel. Instrumented treadmills have been shown in a number of studies to be a valid method of gait analysis, equal in comparison to over ground walking [8,9,15]. Achilles tendon symptom severity was assessed using the validated VISA-A questionnaire . The questionnaire is composed of eight questions covering three domains: Pain, Function and Activity. Questions 1-7 are scored out of 10 and question 8 out of 30. The scores are totaled to give a maximum score out of 100. The lower the score the greater symptom severity. An asymptomatic person would score 100. Individual VISA-A domains and total VISA-A score were used for the analysis. Physical activity level (hours/week) and occupational activity level (sedentary, low, moderate, vigorous) were established. Height and body weight were measured using standardised protocols. Body Mass Index (BMI) was calculated using (kg/m2). Gait analysis was undertaken at the ISEH lab. All participants were investigated walking barefoot on the Kistler Gaitway Instrumented Treadmill™. Prior to recording, participants walked for two minutes on the treadmill at 5 km/h velocity and 0% incline to familiarise themselves with the speed and surface. Gait was then recorded at the same settings for two further minutes. The measurement was repeated if the participant was seen to stumble or if any gross changes were made to their gait pattern during measurement. Gaitway Version 2.08 software recorded variables for each individual left and right stride. Data files were then exported to Microsoft Excel and 20 consistent left and right strides were selected and the variables averaged for each participant. Statistical Package for the Social Sciences (SPSS) version 22.0 statistical software (SPSS Science Inc., Chicago, IL, USA) was used for the statistical analysis. 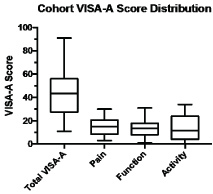 A bivariate correlation matrix using Pearson correlation coefficient was used to identify associations between kinetic variables and VISA-A total score and individual domains. (2-tailed) Pearson correlations were interpreted as 00 to 0.30 (0.00 to -0.30) negligible correlation; 0.30 to 0.50 (-0.30 to -0.50) low positive (negative) correlation; 0.50 to 0.70 (-0.50 to -0.70) moderate positive (negative) correlation; 0.70 to 0.90 (-0.70 to -0.90) high positive (negative) correlation; 0.90 to 1.00 (-0.90 to -1.00) very high positive (negative) correlation . Correlations were made for the total cohort for individual left foot, right foot and an average of both foot strides and VISA-A scores. Correlations were also made between VISA-A scores and the cohort subgroups examining Achilles Tendinopathy in the ipsilateral limb (affected), the contralateral (unaffected) and bilateral limbs (both limbs affected) for participants with bilateral Achilles Tendinopathy. Multiple linear regression analysis was used to quantify the association between the kinetic variables and VISA-A total score and individual domains which revealed 'high' and 'very high' statistically significant Pearson correlations. Binary variables such as gender were recoded into numeric variables to fit the linear regression model. Statistical significance was assumed when P-values were less than 0.05. Participants from 2014 (inception) to 2016 (May week 4) were included in the study. Thirty participants met the inclusion criteria; however, six participants were excluded from the analysis due to incomplete data (Figure 2). Using statistical software G*Power (Version 3) a post-hoc analysis to compute study power based on our sample size of 24 participants revealed a calculated power of 86.32. (Effect size d = 0.5, Significance level α = 0.05). (Calculation process) (Appendix 1). Characteristics of the twenty-four participants are noted Above (Table 1). All participants were found to have mid-portion Achilles tendinopathy on ultrasound scan. Box and whisker plots revealing distribution of the individual VISA-A domains and total VISA-A scores are reported in (Figure 3). 29 variables generated by the instrumented treadmill were analyzed and assessed for correlations with VISA-A scores (Appendix 2). Significant correlations were identified for 16 variables (Appendix 3). Significant correlations between VISA-A scores and kinetic variables were reported for the cohort subgroups: bilateral limbs (both affected limbs), ipsilateral limbs (affected), contralateral limbs (unaffected) and for the total cohort: average of both foot strides and individual left foot and right foot (Appendix 4). Multiple linear regression analyses were performed for 'high' and 'very high' significant correlations. Regression analyses were made between VISA-A scores and the cohort subgroups examining Achilles tendinopathy in the bilateral limbs (both affected) (Table 2), ipsilateral limb (affected) (Table 3). (Table 4), and the contralateral limbs (unaffected) (Table 5). (Table 6) for participants with Achilles tendinopathy. 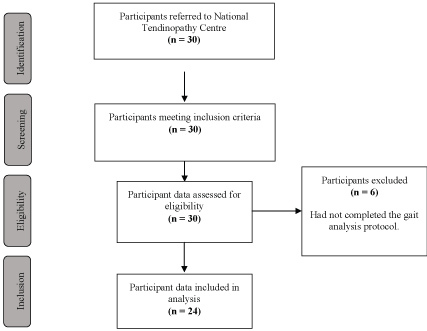 For participants with bilateral Achilles tendinopathy, overall clinical severity was found to be reduced (Increase in Total VISA-A) in those with a greater step length. Critically this correlation remained significant despite adjusting for confounders (age, BMI, activity, gender, duration of symptoms and occupational activity). Notably the coefficient of determination was 96.7% suggesting almost all the variation of the dependent variable (Total VISA-A) had been accounted for. A 1 cm increase in step length resulted in a 2.144 increase in Total VISA-A score (B = 2.144, p = 0.04, R2 = 96.7%). Overall clinical severity was also reduced in bilateral Achilles tendinopathy participants with an increased anteroposterior displacement of centre of pressure (Ax average) which remained significant following adjustment for confounders (B = 0.117, p = 0.020, R2 = 77.5%). Overall clinical severity was noted to significantly increase in left-sided Achilles tendinopathy participants whom had an increased step time in their right foot (non-affected) this remained significant when controlled for age, however not with any additional confounding factors. (B = -343.861, p = 0.050, R2 = 77.8%). Achilles tendinopathy pain was greater in left-sided Achilles tendinopathy participants with a greater weight acceptance peak index (B = -1.058, p = 0.046, R2 = 81.7%), impulse (B = -0.108, p = 0.044, R2 = 67.8%) and also active force peak (B = -0.102, p = 0.025, R2 = 75.4%). Weight acceptance peak index remained significant when adjusted for age, however impulse and active force peak variables did not. Achilles tendinopathy pain was reduced in participants with a greater weight acceptance rate, remaining significant when adjusting for age (B = 0.004, p = 0.024, R2 = 87.9%). Achilles tendinopathy pain was noted to be modestly reduced in left-sided Achilles tendinopathy participants whom had a greater stride length (B = 0.374, p = 0.049, R2 = 66.1%) step length (B = 0.0755, p = 0.044, R2 = 67.7%) and weight acceptance rate (B = 0.005, p = 0.028, R2 = 86.9%) in their right foot (non-affected). Step length and stride length were not significant when adjusting for confounders. Weight acceptance rate remained significant when adjusting for participant age. A reduction in Achilles tendinopathy function was identified in left-sided Achilles tendinopathy participants with a greater weight acceptance peak index, remaining significant following adjustment for age. (B = -0.905, p = 0.014, R2 = 89.8%). Increased double support time in the right foot (unaffected) of left-sided Achilles tendinopathy participants was correlated with a significant reduction in function, (B = -198.526, p = 0.040, R2 = 69.3%) however not significant when taking into account confounding factors. An increase in Achilles tendinopathy activity was noted in bilateral Achilles tendinopathy participants with an increased anteroposterior displacement of centre of pressure (Ax average). This remained significant when adjusting for a number of confounders including age, BMI, activity, gender and duration of symptoms (B = 0.061, p = 0.038, R2 = 71.9). A reduction in Achilles tendinopathy activity was noted in right-sided Achilles tendinopathy participants with a greater base of support in their left foot, significant following adjustment for age, BMI and activity. Notably a coefficient of determination of 99.8% was identified. (B = -1.500, p = 0.033, R2 = 99.8%). Our findings of a greater step length in Achilles tendinopathy participants with lower overall clinical severity and less pain with a greater stride length correlates with findings from Kim, et al. whom reported a shorter step length in symptomatic subjects with Achilles tendinopathy compared to healthy individuals. Other studies on temporospatial parameters in Achilles tendinopathy reported no significant factors. McCrory, et al. are the only other study to date to report significant differences in ground reaction forces and timing between healthy individuals and those with Achilles tendinopathy. Significant increases in time to reach peak forces and increases in braking forces were noted. Our finding of an increased anteroposterior displacement of centre of pressure (Ax average) in participants with a lower overall clinical severity correlates with Van Ginckel, et al. reporting a reduced total forward displacement of the center of force in symptomatic participants with Achilles tendinopathy compared to healthy controls. Despite several significant gait biomechanical characteristics previously being reported in individuals with Achilles tendinopathy, this is the first study to investigate and precisely quantify the association between Achilles tendinopathy clinical severity and gait biomechanics. This is also the first study to identify significant predictors of Achilles tendinopathy clinical severity. Despite the relatively small sample size, a broad range of VISA-A scores were obtained for assessment, enabling gait biomechanics to be correlated to Achilles tendinopathy participants with a comprehensive range of clinical severity. Another important strength of this correlation study was that the regression analysis models used for the majority of variables were very robust indicated by the high R2 values enabling adjustment for key participant confounding factors. Due to the nature of a correlation study only associations can be ascertained and not causation even in the presence of very strong relationships. Despite a sufficient study power calculated, the sample size remains relatively small and thus it is difficult for the results to be applied to the general population as the sample likely suffers from selection bias as it is not a representative sample. A limitation of the physical activity level question identified was that some participants interpreted physical activity to include hours spent doing activities of daily living, whereas some participants interpreted physical activity only as the time spent participating in sporting activities or undertaking exercise sessions. This different interpretation of activity levels makes it difficult to make comparisons between participants. To help minimise the impact of this confounding variable we included a second measure of activity: occupational activity level, which in addition provides a better indicator of the impact of sedentary behavior. In this study, we have established a number of key gait biomechanical variables which following confirmation in prospective studies could be used for screening and diagnostic purposes including alternative predictors of developing Achilles tendinopathy and objective physical markers of Achilles tendinopathy clinical severity, which could be used to complement the VISA-A in the assessment and monitoring of clinical severity. Furthermore, this could be used clinically during rehabilitation. The significant gait biomechanical variables we have identified could be utilised as early return-to-play markers, with individuals reaching certain step lengths, gait speeds and stance widths prior to progressing onto the next stage of a rehab protocol. Temporospatial parameters including step length and stride length can be easily and quickly identified in clinical practice without the presence of expensive and specialized gait analysis equipment. This is the first study to establish several gaits kinetic and temporospatial parameters that correlate significantly with Achilles tendinopathy clinical severity. This analysis offers significant contributions to the evidence base of the relationship between Achilles tendinopathy and biomechanics. Notably step length and anteroposterior displacement of center of pressure demonstrated robust correlations in individuals with bilateral Achilles tendinopathy prior and post controlling for confounding factors. Overall clinical severity in Achilles tendinopathy was noted to be drastically increased in left-sided Achilles tendinopathy participants whom had an increased step time in their right foot. However, this relationship did not remain significant when all confounding variables were controlled. Future prospective studies in large populations should utilise the significant gait biomechanical variables identified in this study enabling the development of screening and rehabilitation markers which could have significant clinical applications. Maffulli N, Wong J, Almekinders LC (2003) Types and epidemiology of tendinopathy. Clin Sports Med 22: 675-692. Johannsen FE, Gam AN (2010) Achillodynia is not just a sports injury. Ugeskr Laeger 172: 3325-3329. Lysholm J, Wiklander J (1987) Injuries in runners. Am J Sports Med 15: 168-171. Kvist M (1994) Achilles tendon injuries in athletes. Sports Med 18: 173-201.
de Jonge S, van den Berg C, de Vos RJ, van der Heide HJ, Weir A, et al. (2011) Incidence of midportion Achilles tendinopathy in the general population. Br J Sports Med 45: 1026-1028. Paavola M, Kannus P, Järvinen TA, Khan K, Józsa L, et al. (2002) Achilles tendinopathy. J Bone Joint Surg Am 84-A: 2062-2076. Lorimer AV, Hume PA (2014) Achilles tendon injury risk factors associated with running. Sports Med 44: 1459-1472. Dierick F, Penta M, Renaut D, Detrembleur C (2004) A force measuring treadmill in clinical gait analysis. Gait Posture 20: 299-303. Riley PO, Paolini G, Della Croce U, Paylo KW, Kerrigan DC (2007) A kinematic and kinetic comparison of overground and treadmill walking in healthy subjects. Gait Posture 26: 17-24. Perry J, Burnfield JM (2010) Gait Analysis: Normal and Pathological Function. J Sports Sci Med 9: 353. Iversen JV, Bartels EM, Langberg H (2012) The victorian institute of sports assessment - achilles questionnaire (visa-a) - a reliable tool for measuring achilles tendinopathy. Int J Sports Phys Ther 7: 76-84. Robinson JM, Cook JL, Purdam C, Visentini PJ, Ross J, et al. 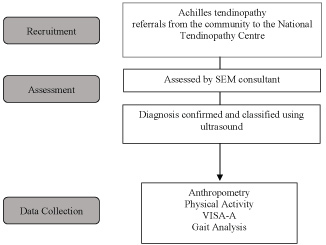 (2001) The VISA-A questionnaire: a valid and reliable index of the clinical severity of Achilles tendinopathy. 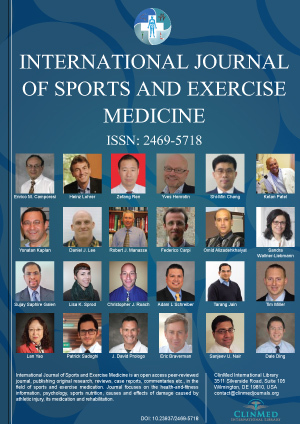 British Journal of Sports Medicine 35: 335-341. Ogbonmwan I, Kumar BD, Paton B (2018) New lower-limb gait biomechanical characteristics in individuals with Achilles tendinopathy: A systematic review update. Gait Posture 62: 146-156. Council MR (2016) Do I Need NHS Research Ethics Committee (REC) Approval?. NHS: Health Research Authority. Fellin RE, Manal K, Davis IS (2010) Comparison of lower extremity kinematic curves during overground and treadmill running. J Appl Biomech 26: 407-414. Mukaka MM (2012) A guide to appropriate use of Correlation coefficient in medical research. Malawi Med J 24: 69-71. Kim S, Yu J (2015) Changes of gait parameters and lower limb dynamics in recreational runners with achilles tendinopathy. J Sports Sci Med 14: 284-289. McCrory JL, Martin DF, Lowery RB, Cannon DW, Curl WW, et al. (1999) Etiologic factors associated with Achilles tendinitis in runners. Med Sci Sports Exerc 31: 1374-1381. Van Ginckel A, Thijs Y, Hesar NG, Mahieu N, De Clercq D, et al. (2009) Intrinsic gait-related risk factors for Achilles tendinopathy in novice runners: a prospective study. Gait Posture 29: 387-391.